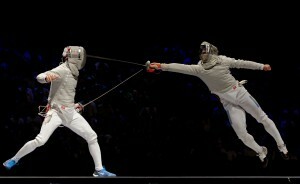 Ibtihaj Muhammad, a 30-year-old fencer on the United States Olympic team, has not won a medal or even competed yet, but her story is already making headlines and breaking records. At the South by Southwest festival this weekend in Austin, an American Olympic fencer was asked to remove her hijab for an identification photo which sparked a controversy on Twitter. PHOTO VIA WIKIMEDIA COMMONS. Despite constant discrimination and external doubt because of her race and religion, Muhammad has stayed focused and is on her way to becoming the first American woman to compete in the Olympics wearing a hijab. Her road to Rio 2016, however, has not been a smooth one. While attending the South by Southwest festival in Austin, Texas Saturday, Muhammad was asked to remove her hijab in order to register. “I was asked to remove my hijab at SXSW Registration for my ID badge … I can’t make this stuff up,” she tweeted. Her social media post received more than a thousand retweets, according to CNN. With the already sensitive climate regarding Muslim Americans, her incident sparked anger and frustration in a lot of her followers. She also caught the attention of the festival’s organizers. Unfortunately, Muhammad is a little too familiar with these discriminatory situations followed by blank apologies. From the start of her athletic career, she faced difficulties that most of her competitors probably didn’t. “In the Muslim community, there is a sense that you are always a doctor or lawyer,” so when she found a sport with a uniform that followed her religion, Muhammad’s family allowed for her to follow her dream, she told CNN. Despite her early struggles, something positive did come from these experiences — she gained a new perspective on what it was like to live in a world that was constantly pushing her down and that did not in any way facilitate her success. Breaking stereotypes in her sport meant that she did not have anyone to look up to or who understood what she was going through. Muhammad said she hopes to be an inspiration for young Muslim women in a time when the anti-Islamic climate in the United States might seem like a barrier too big to overcome. Her tenacity and talent have proven that just because society has yet to accept certain groups of people, it does not mean any one of us should allow discrimination and ignorance on this scale. The color of someone’s skin does not determine their character, just like whether or not a woman decides to honor her religion through an article of clothing does not categorize her as inferior. That is exactly what Muhammad stands for. Whether or not she comes home with a gold medal, Muhammad has already done more for the country than most other athletes and she has used her platform as an Olympic athlete to advocate for change. She stands for the values and morals that all Americans should encompass, and she is someone who we should all be proud to have representing the United States in Rio this summer. ← What is the balance for LGBT+ communities at Christian colleges?